She’s young, bright, has low tolerance for `powerful’ troublemakers, asserts her authority confidently and is controversies’ favourite child. That’s Sonia Narang for you, the 33-year-old SP of Belgaum. A native of Chandigarh, she excelled in her studies in School and college and was a gold medalist in the Punjab University. Her father retired as a deputy superintendent of police. She cleared the civil services after two failed attempts in 2002. At the Lal Bahadur Shastri Academy in Mussoorie she met her life partner, Ganesh Kumar while training for IPS. It was not a happy love story but all went on well and got married to him in 2005. She has son Shaurya, she is very religious and never leaves home without performing the puja. 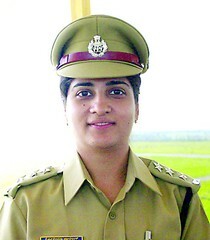 Her husband is a IPS of the Bihar Cadre. The interview is very nice to read and I would request all to read the full story here. I have met you couple of times and I believe our country needs more officers like you………………..